Rassa Pataudi: Rassa Patodi recipe is variation of shev bhaji and tastes awesome when eaten with bhakri, poli (roti), or phulki. It is a typical Maharashtrian recipe which is made in different parts of maharashtra with little variation in rassa. The procedure involves making the Patwadis or Patodis (Gram flour or Besan vadis) and then adding them to the curry (Rassa). In a bowl, take chickpea flour. Add in the white sesame seeds, turmeric powder, red chilli powder, garlic paste and cooking oil. Add in salt as per the taste. With the help of water, make a hard (tight) dough of it. With dash of chickpea flour, make a disk of the dough. Cut it into strips or your desired shape (diamond shape etc). Heat 1 tbsp oil in a pan, on medium heat. Add in the coriander seeds, cumin seeds, poppy seeds and let them splutter. Add roughly chopped onions, dried red chilli, garlic cloves, Cashews and salt. Cook until the onions turn dark brown. Grind the mixture with the help of little water. Heat 3 tbsp oil in a pan, on medium heat. Add in the gravy (which we have grinded above) for about 5 min. As the gravy starts leaving the oil, add in the red chilli powder, all spice powder and sugar. Add water to it to make a gravy. Add the pataudi strips and cook the gravy till the strips floats over the top of the gravy. Rassa Pataudi is ready to be served. 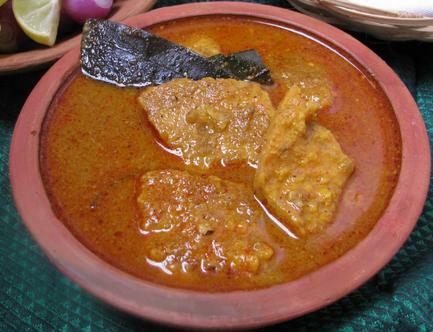 Serve hot rassa pataudi with hot steamed rice. If you have any queries regarding the Rassa Pataudi recipe, please leave a comment.